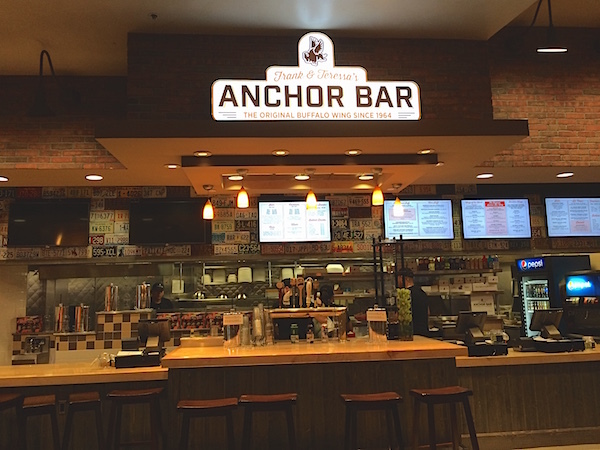 Earlier this summer Anchor Bar, “Home of the Original Buffalo Wings™“, opened a Vegas location at the Grand Canal Shops food court at The Venetian. When I visited Anchor Bar in June I didn’t notice that they had 2 TV’s to the left side of the bar because they were turned off. You can see a picture of the screens here. During NFL Sunday’s these TV’s will be showing NFL games. One TV will always be dedicated to the home town Buffalo Bills. · A free wing sauce pack during Buffalo Bills game if they win! Station Casinos just announced that they’re adding a new football contest to go along with the two popular contest that have been around for years. The entry fees are so low that there are a ton of entrants. That makes winning the contests difficult. I played the year I moved to Las Vegas but not since. Maybe that will change this year. 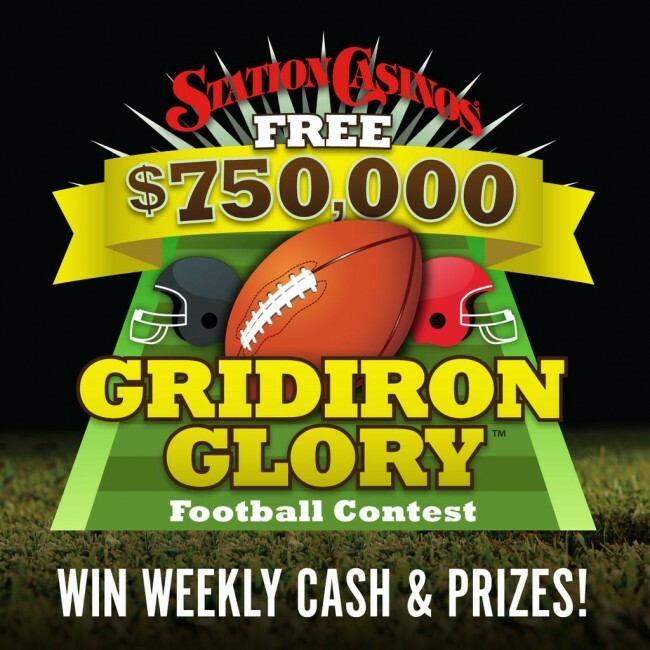 LAS VEGAS (August 3, 2015) – Station Casinos gears up for football season and moves into the next football contest evolution with the $750,000 Free Gridiron Glory. The new pro-football contest, based on guest feedback, offers many firsts for Station Casinos. The interactive contest utilizes the Boarding Pass Rewards Kiosk to track play in addition to the contest being free to enter. It also gives guests the opportunity to include picks from Thursday games and continues into the Playoffs and Championship game. Station Casinos’ popular Last Man Standing Pro and College Elimination football contests are back and will offer up to $250,000 in cash prizes. 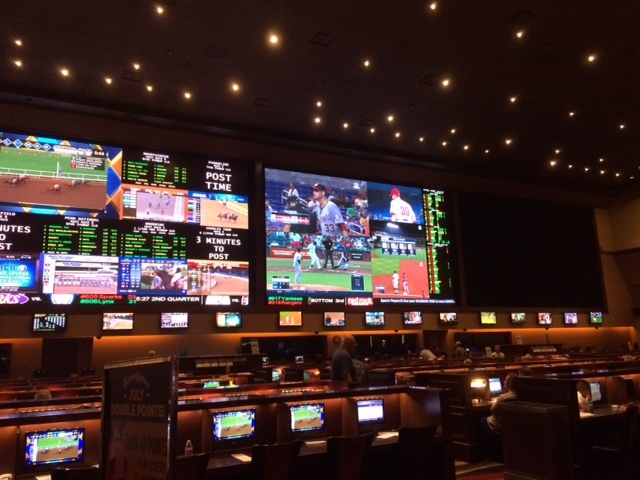 There’s also no better place in town to watch and enjoy all of the excitement of professional and college football games than Station Casinos’ sports books. Registration begins Wednesday, Aug. 5 at 10 a.m.
College football: Saturday, September 12 at 7:30 p.m.
Professional football: Sunday, September 13 at 9 a.m.
Last Man Standing is available for play at all Station Casinos; the Fiestas; Wildfire Gaming properties including Wild Wild West, Barley’s, Wildfire Sunset, Wildfire Rancho, Wildfire Casino & Lanes and Wildfire Boulder; El Cortez; and Baldini’s Casino in Northern Nevada. If you’ve read this blog for a while or follow me on twitter you probably know that Red Rock Resort is my 2nd office and local bar. During the summer I’m at the casino at least 2-3 times a week. That covered parking is nice on hot and sunny days. On a good day I’ll work in a quiet area then head to the sportsbook for some low key work. For the past week or so I’ve noticed that there has been a drop cloth covering one of the large screens. On my last visit (Saturday) I noticed that the cloth moved to the center screen revealing a new clear screen to the left. You may not be able to tell from the photo above but the clarity from the screen all the way on the right is much much better. The screen upgrade is definitely overdue and come just in time for football season. While I was in the sportsbook I think I heard improved audio but I could have just been looking for that. I’m told that I’ll get an overview of the full upgrades in a few weeks. 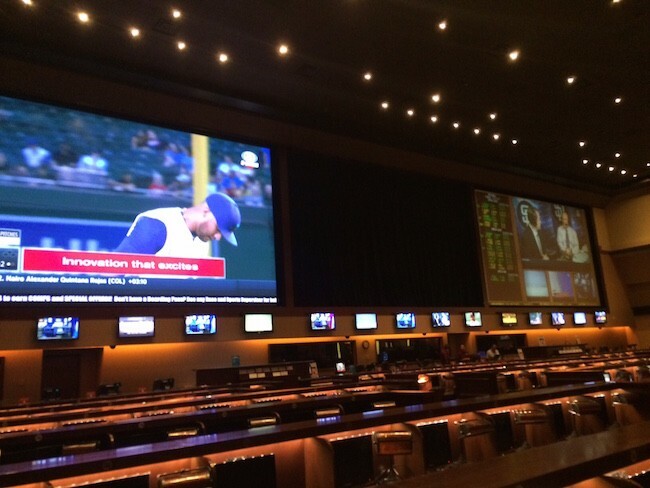 The Red Rock sportsbook is probably the best off strip sportsbook besides the Westgate. I look forward to seeing what else they do. Soon enough. UPDATE: They’ve installed the 2nd of 3 screens. UPDATE 2: Screen installation is complete. William Hill is not messing around. They’ve already released NFL Super Bowl futures odds for 2016. Yes, next year. These will surely change but I figure that I’d share them now to give you something to read in between playoff games. There are a lot of great places to watch NFL games in Vegas today. It wasn’t always that way and it feels like forever since I first started going to Blondies at Planet Hollywood to watch NFL games on a Sunday. Blondies is tucked away in the back of the Miracle Mile Shops and even though it’s always packed for NFL games it seems as if people still don’t know that it exists. 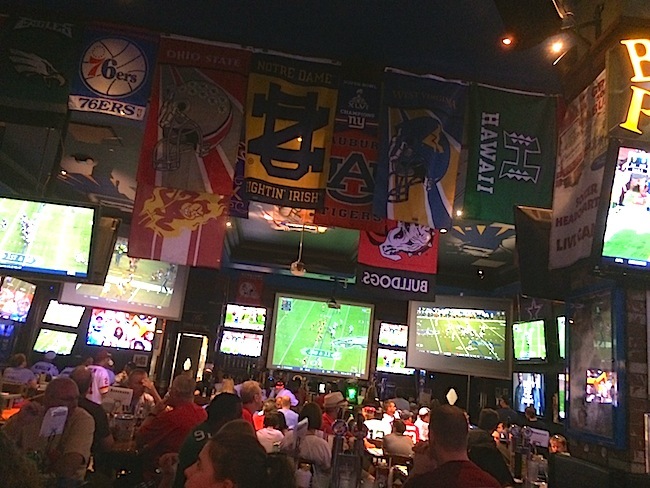 Blondies is an old school sports bar with booze, food, beer pong and lots of TV’s. Blondies isn’t a sportsbook so you’ll have walk about 2 minutes into the Planet Hollywood casino to make a bet if you don’t have an app on your mobile phone. Blondies has become so popular in the past couple of years that they’ve started charging table minimums for watching games on busy days (like NFL Sunday). You can reserve a table for however many you want for the different time frames of games. There are different costs for different events. We had to make a $100 deposit to reserve for a table for 4 people to watch the 10am games. The $100 deposit would come off of our bill. Four people eating and drinking $100 over a 3 hour period isn’t much of a challenge so the table minimum isn’t a big deal. Having a guaranteed seat to watch all of the games with food and drink service is much more appealing to me than waking up early and squatting at a sports book. The food is fine but not great. The waitress service is on point and there are lots of football fans wearing jersey’s and cheering for their favorite teams. Most importantly there more TV’s than may be necessary. There are so many TV’s that they have extras to show stuff like international soccer while football is going on. The ability to reserve a table might be the best feature. Watching the games at Blondies almost feels like you’re not on the Vegas Strip. There’s a hometown bar feel. You might notice flags for all Philadelphia teams to the left in the picture. If you’re looking for a sports bar where you can guarantee your seat so you can eat and drink while your watch the games after you place your bets Blondies is a great option.